The long delay since the Zeppelins’ last game on August 12 found the team with a few cobwebs that had to be worked out. The DCFS team practiced during the layoff, and it showed. DCFS got on the board quickly and managed to score in every inning except the fifth, when LED got them three-up, three-down. They took the lead from the start and LED could not catch them. The Zeppelins didn’t get a hit until the second inning when Gary Beadle hit a shot to right field. Eddie James followed with another shot to right which pushed Gary to third. Both were left stranded and LED didn’t get another hit until five batters later in the third inning. With two away Chelsea Harris hit a single to left field but was also left stranded. In the fourth, Corey Dorsa hit a single to right center and a few bats later Gary hit a double which put both he and Corey into scoring position. But it wasn’t meant to be as both men were left stranded again. It wasn’t until the top of the sixth that LED managed to get on the board. Chelsea started the rally with a single to left center, followed by a single from Russell Richardson. Corey then hit a double which scored Chelsea and put Russell on third. Jayson then hit a single to left which scored Russell. Devin Harrison then hit a sacrifice fly to score Corey. The Zeppelins had put three on the board but were still trailing. After sitting out the first inning awaiting his turn in rotation to the outfield, Jayson grabbed a cold one from Anne Villa’s ice chest and announced that he had just had his “Superman juice” and was ready to play. The powers obviously did not include flying (or maybe he needed the cape to go along with the juice) because he didn’t manage to stop the homer that flew about 30 feet over his head. Out of nowhere DCFS recruited a ringer for the playoffs who sent three over the fence, including the one that sailed past Jayson. A little fishy…. The Zeppelins have to wait until next year to wallow in the fun again. Thanks to all the players and fans who supported the team all season long. Many thanks to all who stepped up to the plate for LED. PLAYERS: Anne Villa (Undersecretary), Chelsea Harris (Louisiana Job Connection), Corey Dorsa (SEC), Devin Harrison (Business Development), Eddie James (Business Development), Eric Burton (Business Incentives) Gary Beadle (IT), Jayson Newell (Business Development), Katie Richardson (Russell’s wife), Russell Richardson (Business Development) and Rachelle Kilgo (Business Intelligence). FANS: Paula Bryars, Mills Richardson (Russell’s son), and Chelsea’s beau Brandon. 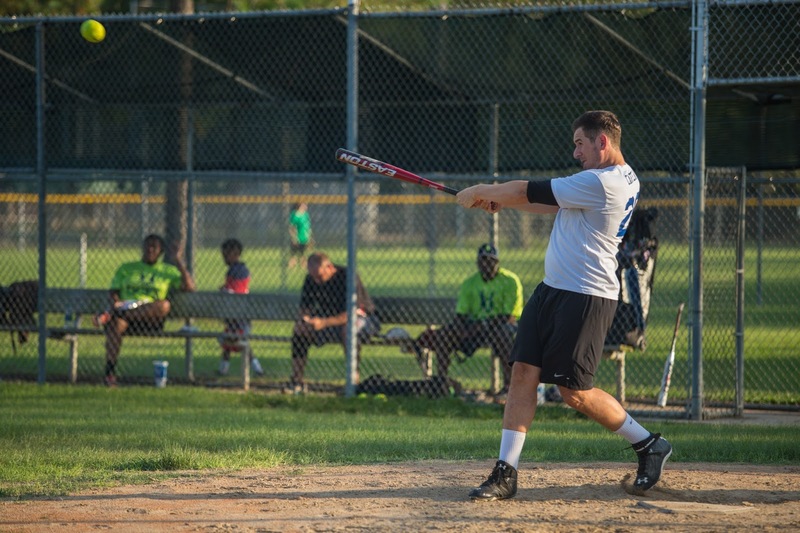 Records were broken in LED’s stunning upset victory over the Department of Children and Family Services last night at Perkins Road Park in the final game of the regular season. 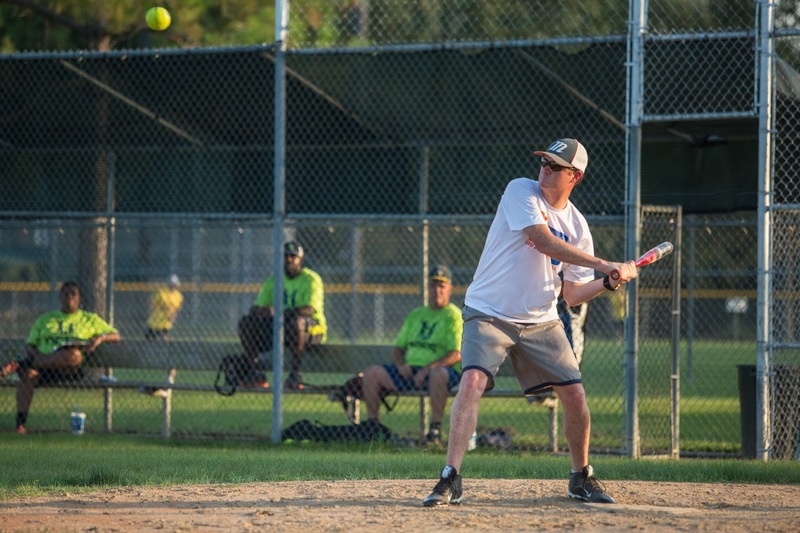 DCFS won the league championship in 2012, was the league runner up in 2013, and had an 8-0 record last season, outscoring their opponents by 56 runs. This was a tough opponent and the only thing to be said is that the Zeppelins played GREAT! Rising to the challenge, the Zeppelins made it happen by getting 33 hits (record) and putting up a combined team batting average of .733 (record). LED even batted around the order plus some in three separate innings (record), putting up 16 runs in the process (record). Jayson Newell led the offense, going 5 for 5 on the night (record). After last night’s performance, Jayson ended regular season play with a team high .724 batting average on 21 hits in 29 at-bats. Four other players hit 4 for 5 last night, and the remaining Zeppelins all went 3 for 5. Not a single player batted less than .600 (record). And to top that off, every Zeppelin had at least one RBI (record); both Corey Dorsa and Gary Beadle tallied three RBI’s each. The matchup was a rainout makeup game from earlier in the season that had left LED up 1-0 after the top of the first inning when the sky opened up and drenched everyone. Last night’s game picked up in the bottom of the first with DCFS at bat, and they proceeded to score an early run to tie the game at 1-1. At the top of the second the LED bats went wild, sending all nine players to the plate, three even getting to bat a second time in the inning. The Zeppelins scored seven runs on twelve hits before ending the inning. DCFS then tacked on one more run in the bottom of the second, leaving the score with LED up 8-2. Neither team scored in the third, but the LED bats got hot again at the top of the fourth. The Zeppelins again batted the entire lineup plus one, scoring five more runs on seven hits. DCFS could not answer at the bottom of the inning. The Zeppelins then tacked on another run in the fifth, and DCFS did the same, putting the score at 14-3. LED had a few more hot bats in the top of the sixth, adding two more runs to put the score out of reach at 16-3, where it remained for the duration. As the Zeppelin batters continued to find the gaps and “hit it where they ain’t,” the defense put on a show of its own. LED was at a disadvantage because the team had to play without a catcher and with only three outfielders due to the fact that only two lady Zeppelins were available for the night. Despite the disadvantage, the defense shut down any offensive attack DCFS tried to put up. From the mound, Eddie James was particularly elated at having kept the ball inside the park the entire game. This is quite a feat with a team that usually hits a few over every game. Several traveled to the fence, but the LED fielders caught them all. There was not a single error in the outfield, manned in rotation by Jayson, Gary, Corey and Russell Richardson. Corey and Russell both brought in short flies they had to scoop on the run, and all of the outfielders had to catch at least one long fly near the fence. Gary brought in four flies from center field, and Jayson, Corey and Russell all snagged two flies a piece. The infield looked sharp as well. Paige Ovens put out three batters unassisted and assisted in another four from second base. Chelsea Harris put out one unassisted and assisted in three from third base. Eric Burton put out three unassisted, including a leaping line drive catch, and assisted in another two from shortstop. Russell put one out unassisted and assisted in another at first base, and David Carter assisted in two outs in his rotation at first base. Miraculously Eddie had no balls hit directly to him at pitcher, but he stopped more than one run from scoring by covering home on throws in from the field. Ultimately, the game was the best performance of the Zeppelin team as a whole since the inception of the team in 2011. On a final note, Eddie had a tough time with the opponents taking out their frustrations on him at the shellacking they were getting. One of the men threw a late elbow into Eddie’s chest as he crossed first base. He was knocked to the ground twice with players obstructing the bases and baselines. And the DCFS third basewoman had a serious issue with his three-code system to assist outfielders with positioning based on the batter. Apparently she mistook the codename “light” to mean Eddie was personally calling her a weak player. The entire game she kept repeating “I’m just a lightweight here.” It wasn’t the only misunderstanding during the game, but it was definitely the funniest. With the win LED ended the season 3-4-1 and may be headed to the playoffs. The final playoff list will be out as soon as the rest of the teams finish making up all of their rainout games. NOTE: At the top of the first LED had singles by Ashley Falcon, Devin Harrison, Jayson and Russell (who drove in the RBI). PLAYERS: Chelsea Harris (Louisiana Job Connection), Corey Dorsa (SEC), David Carter (BRAC Liaison), Eddie James (Business Development), Eric Burton (Business Incentives) Gary Beadle (IT), Jayson Newell (Business Development), Paige Ovens (Business Development), and Russell Richardson (Business Development). FANS: Rick Ward, Leigh Anne Burton and precious daughter Sophie (who kept waving to her dad), Katie Richardson (who drove straight to the field from the airport but not in time to take the field) and son Mills, Lori Melancon was there snapping more pictures, and Matthew Wattigny was snapping pictures as well as he was testing his new camera. 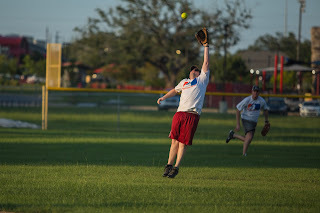 Check out the LED Softball Blog at http://ledsoftball.blogspot.com/ for news of the Zeppelins’ past games. Below are some amazing action shots taken by Matthew Wattigny at last night’s game. Check out Eddie’s expression as he approaches his nemesis at third base! The Zeppelins played tough against a strong Baton Rouge Police Department team last night at Perkins Road Park. 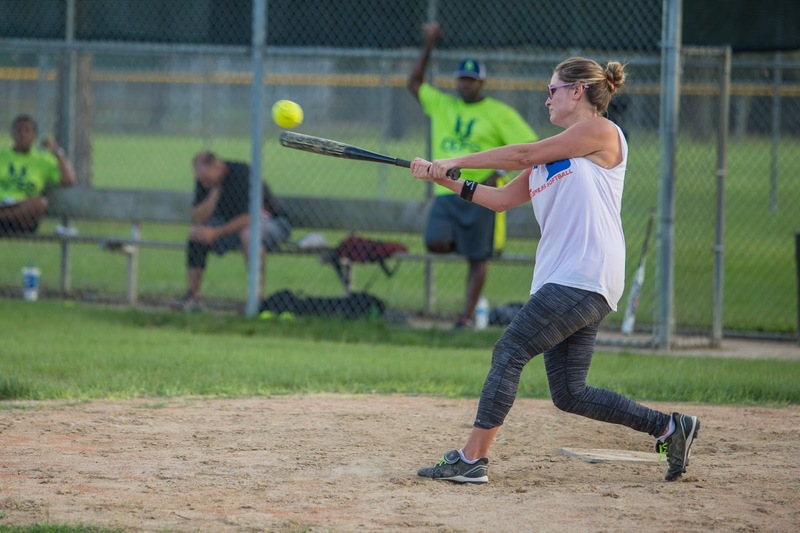 Coming into the game, LED knew that the BRPD team had outscored their opponents in five games this season by 30 runs, and had four players who were solid homerun hitters throughout the season. But LED played strong defense and kept the game close, in the end losing by only one run at 9-8. The Zeppelins put up 11 players who provided 23 hits and a combined team batting average of .590. At the plate Russell Richardson went 4-4 with 2 RBIs, Matthew Wattigny went 3-3, and Jayson Newell and Ashley Falcon both went 3-4, both plating RBIs. LED struck first and struck hard at the top of the first inning. Consecutive singles by Jayson, Corey Dorsa, Ashley, Eddie James, and Russell plated three runners. Katie Richardson then put up a sacrifice grounder to plate another, and Chelsea Harris tacked on a sacrifice fly to left to plate a fifth run. 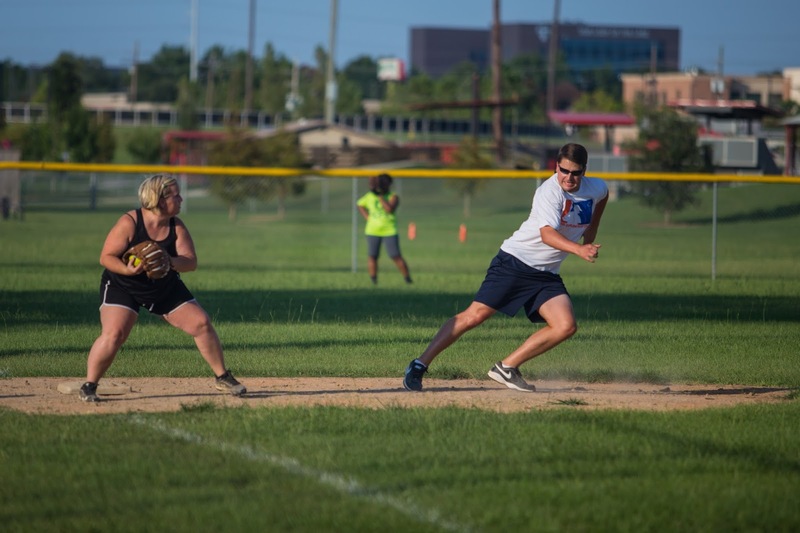 BRPD was held to no runs at the bottom of the first by the work of Eddie on the mound and Chelsea at 3rd base. The Zeppelins then added another two runs in the top of the second on a double by Korey Patty, followed by a single from Matthew, a single by Jayson which drove in Korey and a single by Ashley which drove in Matthew. BRPD was able to score a run in the bottom of the inning, putting the score at 7-1. 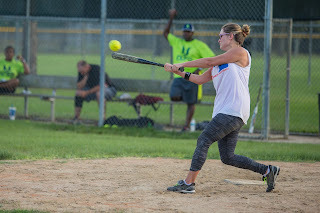 At the top of the third with consecutive singles by Russell, Katie, and Chelsea, the stage was set for Gary Beadle to drive in Russell with a single to the outfield. LED was now up 8-1 but would not score again the rest of the game. That was when the BRPD homerun hitters’ bats got hot. With two runners on base a BRPD batter sent one over the center field fence, bringing the score to 8-4. Then again in the bottom of the fourth BRPD tacked on another five runs with a few hits followed by another homer. Neither team scored after this. On defense the LED outfield was challenged more than ever this season, and they rose to the task. Gary, Jayson and Korey combined for six outs on deep fly balls, and Katie kept the runners honest by getting two line drives quickly in to the infield. The infield was busy as well as Eric Burton put out three unassisted, and assisted in another four at shortstop. Russell put out three unassisted, and assisted in another three at first base. Eddie snagged two flies from the mound, threw two out at first, and put a runner out at home on a fielder’s choice from Chelsea at third. Ashley put out three at second base with the help of Eric. On a final note, a few LED players were lamenting that there was no beer in the dugout, but others pointed out that it was undoubtedly a good thing since the parking lot was filled with police cars. RBIs: Ashley, Chelsea, Eddie, Gary, Jayson, Katie, Russell (2). PLAYERS: Ashley Falcon (Civil Service), Chelsea Harris (Louisiana Job Connection), Corey Dorsa (SEC), Eddie James (Business Development), Eric Burton (Business Incentives) Gary Beadle (IT), Jayson Newell (Business Development), Katie Richardson (Russell’s wife), Korey Patty (Lead Development), Matthew Wattigny (FastStart), and Russell Richardson (Business Development). FANS: Mills Richardson - Mills was extremely helpful as the team batboy for the Zeppelins and warm-up catcher for both teams. Zeppelins Bring Down The House – Again! 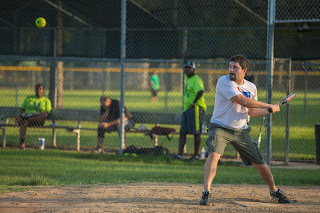 LED put up a massive offensive attack against the House of Representatives “Hurricanes” last night at Perkins Road Park. With only eight Zeppelins in the lineup the team scored 15 runs on 25 hits, and put together a combined team batting average of .625. Corey Dorsa and Eddie James both turned in 4 for 5 performances at the plate, and five other Zeppelins went 3 for 5. Eddie had two singles, a double and a triple, scored three times and drove in four runs. Corey had four singles, scored four times, and drove in two runs. Ashley Falcon had a single and two doubles, scored twice, and set a Zeppelin record with five RBIs. Russell Richardson had two singles and a double and drove in two runs. LED put up a strong defense as well against the 12 Hurricane batters they faced. Eddie put out 10 Hurricanes from the mound, including three strike outs. Russell assisted in seven put outs from first base, Jayson Newell had six from shortstop, and Paige Ovens added five more from second base. Corey made a great play in center field, throwing out a runner at second base from the ground. And Korey “The Original” Patty’s fly ball catch in deep right field at the top of the seventh with LED up 15 – 7, ended any Hurricane hope of a comeback. Finally, while Ashley and Coach Linda Regira were discussing the brain eating amoeba found in the Donaldsonville water supply, Eddie indicated that he had read that, thought about Regira, and said that it “explained a lot.” Not sure where he was going with that. And, with the exception of the small boy in the stands who Jason made cry, a great time was had by all. 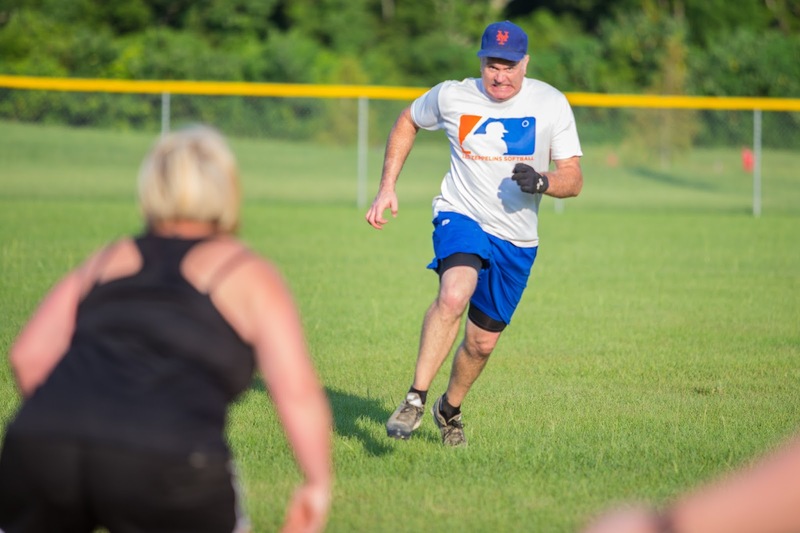 The Zeppelins take on the Baton Rouge Police Department next Wednesday at Perkins Road Park. LED should definitely get “lawyered up” for this game because, as league rumor has it, the police games are shrouded in controversy. PLAYERS: Ashley Falcon (Civil Service), Chelsea Harris (Louisiana Job Connection), Corey Dorsa (SEC), Eddie James (Business Development), Jayson Newell (Business Development), Korey Patty (Lead Development), Paige Ovens (Business Development), and Russell Richardson (Business Development). FANS: Lori Melancon arrived to take pictures of the game. 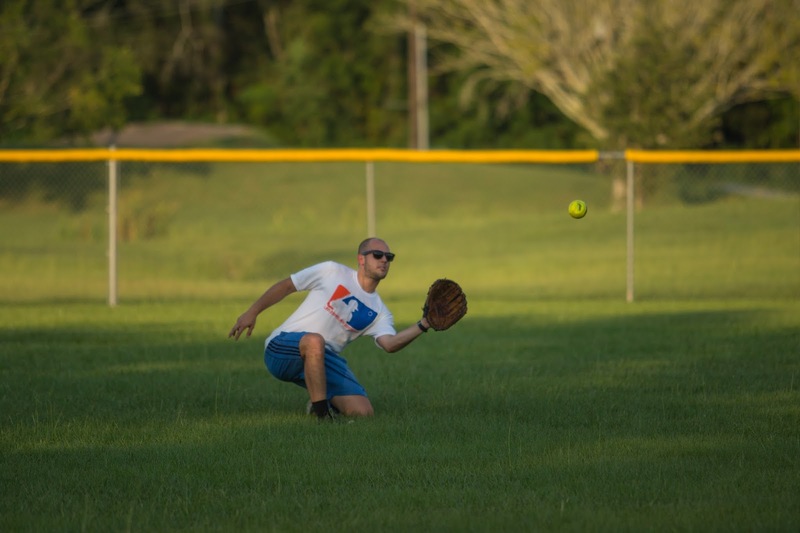 The Zeppelins faced off against DOTD last night at Perkins Road Park to play what was a tight, lead-trading match until the two teams were tied 5-5 going into the final inning. DOTD started off the top of the first by scoring one run on a solo homer by their pitcher. The LED defense cracked down and got out of the inning leaving them with runners stranded on second and third. LED was unable to plate a runner at the bottom of the inning, and left Paige Ovens and Jayson Newell stranded on base. At the top of the second DOTD plated another runner to bring their lead to 2-0. LED answered back by scoring two runs in the bottom of the inning. Eddie James started the rally with a single to the right side of the field. Gary Beadle then produced his own single to deep right, which Eddie stretched into a two base advance, landing on third. Chelsea Harris hit a hard line drive into left center which plated Eddie. Eric Burton then hit into a fielder’s choice ending in Chelsea being out at second but pushing Gary on to third as a setup for the next hit. David Carter then hit a single to plate Gary before the inning ended deadlocked 2-2. DOTD then tacked on two more runs in the top of the third with the same four-man combination they would come to rely on later in the game. The Zeppelins answered back with a run in the bottom of the third. Paige led off with a single to the left side and Jayson legged out a single to the right side. Corey followed up with a single to load the bases. Ashley hit a fly that backed up the shortstop toward the outfield, allowing Paige to tag up and score, and narrowing the DOTD lead 4-3. The Zeppelins held DOTD to no runs in the top of the fourth, while coming back to add two more runs in the bottom of the inning. Gary led off with a single to right field followed by a single from Chelsea to left field. Eric again hit into a fielder’s choice leaving Chelsea out at second but pushing Gary to third for a score on the next hit. Matthew hit a fly to the second baseman who then made a bad throw trying to nail a runner not tagging up. This allowed Gary to score and Matthew to get the RBI. David then got up and hit another great shot to the right side, plating Eric, and putting the Z’s up 5-4. DOTD answered with another run at the top of the fifth with the same quartet of guys. LED was unable to answer at the bottom so the inning ended with the score tied again at 5-5. Neither team scored in the sixth, so the game went into the final inning to determine the winner. 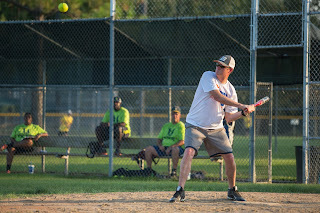 Having gotten back to the top of their lineup, DOTD then brought up the same quartet of guys and coaxed a few LED miscues to plate all four, putting the game out of reach at 9-5. The Zeppelins have nothing to feel bad about and everything to feel good about because for the second game this season they have had to play at a disadvantage. 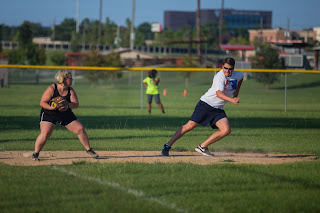 The other teams only fielded two women (one behind the plate), which means LED’s coed team is in effect playing against a mostly all-male opponent. The fact that the team can hang in these odds is a testament to the strength of LED’s female players. GEAUX GIRLS! 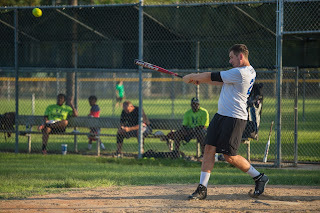 Next week LED will face the House of Representatives, and our old friend/former co-worker/homerun hitter Daniel Waguespack, on Wednesday at 6:00 at Perkins Road Park. Hits: Chelsea (2), Corey, David (2), Eddie, Eric (2), Gary (2), Jayson (2), Paige (2) and Russell (2). PLAYERS: Ashley Falcon (Civil Service), Chelsea Harris (Communications & Marketing), Corey Dorsa (SEC), David Carter (BRAC Liaison), Eddie James (Business Development), Eric Burton (Business Incentives), Gary Beadle (IT), Jayson Newell (Business Development), Matthew Wattigny (FastStart), Paige Ovens (Business Development), and Russell Richardson (Business Development). FANS: The Zeppelins had two LSU athletes in the dugout for the game pulling for them. Ashley’s little sister Alayna plays softball for LSU (as did their other sister Allison), and Ashley’s roommate Hannah Robinson played tennis at LSU with Ashley’s cousin Megan Falcon (LSU’s only three-time singles All-American and the highest ranked NCAA seeded player in the history of LSU tennis). Hannah has an even longer family history with LSU sports. Her grandfather is former Tigers football standout Johnny Robinson, who starred in LSU's 1958 national championship team and went on to play professionally for the Kansas City Chiefs. Her great-grandfather is former LSU men's tennis coach W.T. "Dub" Robinson, for whom the Tigers' tennis stadium is named. After the Zeppelins game ended the three girls got out on the field and participated in some fast pitch action. Unfortunately for Corey who was playing catcher for them with no equipment, he was smacked in the neck by a foul tip on a 65 mile-per-hour pitch from Alayna. If you see him today ask to see the bruise! The group then decided they would continue play without a catcher. Well nobody is bragging, but the Zeppelins have put their first season win in the books. It was a team effort as the Zeppelins faced the Wildlife & Fisheries team at Perkins Road Park last night. LED played strong defense and put up strong numbers at the plate. W&F was truly a class act, and it was a pleasure to play ball against a team so evenly matched with LED in both ability and love for the game. There was not one controversial call even though their coach IS a lawyer. Paige Ovens lead the offense with a 3 for 3 performance. Eddie James and Gary Beadle both went 2 for 2, and Ashley Falcon, Russell Richardson, Eddie James, Chelsea Harris and Matthew Wattigny all knocked in RBIs in their at-bats. Ashley and Russell both hit doubles on the night as well. 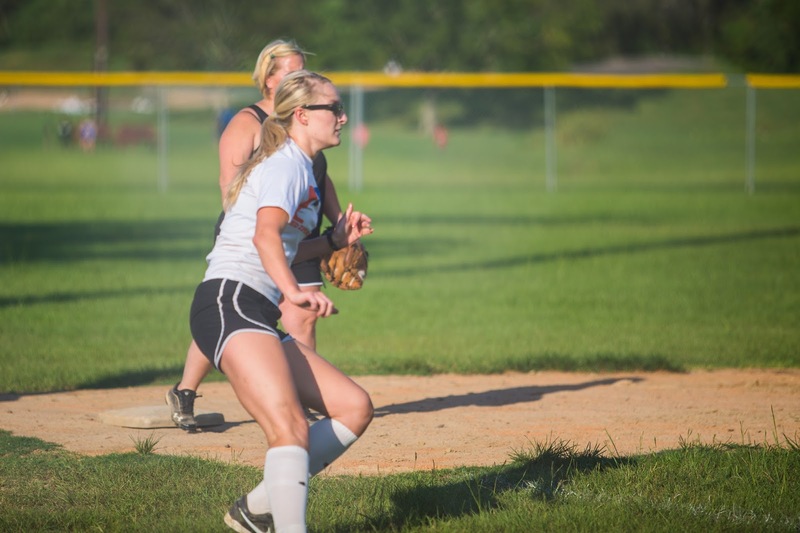 And rookie player Rachelle Kilgo, a library intern in Business Intelligence, made a solid debut at catcher. Solid defense by both teams left the score unchanged after the second inning. The “Wildlifers” then came back to score two more in the top of the third from their same four-man starting lineup which left LED with only a one run cushion. LED then scored again in the bottom of the fourth when Eddie led off with a single to right followed by a single from Gary, which Eddie stretched for two bases to end up on third. A few bats later Matthew put one beyond the right side of the infield to score Eddie. Third base coach William “Rounding 3rd” Day saw a chance for Gary to score as well so he sent him on. Gary unfortunately had to watch the throw in as he was put out 9-6-2 at the plate. He could have been safe if he had only knocked their female catcher off of the plate, but he was too much of a gentleman to do such a thing. LED now had a two run lead. The Zeppelins held strong on defense not allowing any runs until the top of the sixth. Their team speedster named “Slow” on his jersey got up and hit a line drive to the outfield for a double. Their long-ball hitter then hit a single up the middle to put runners at first and third. The next batter, their female catcher, hit a shot out to left center, scoring a run. But Gary was in left center and he quickly threw the runner out going to second. If he had just piled into her on the play at home earlier…….. 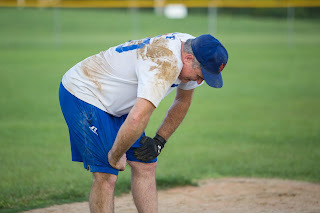 The “Godfather” then got a ton of ribbing from his team for hitting a shot which had him safe at first, at the cost of getting his female teammate out at second by a fielder’s choice which Paige tossed to Eric. The next out left LED up by only a single run, but it was enough as the Zeppelins mowed the “Wildlifers” three up, three down in the top of the seventh. Eric threw out the leadoff batter at first, and Eddie scampered for grounders on the next two batters, putting them both out at first. A great time was had by all and everyone is looking forward to another win this week. LED will face DOTD on Wednesday at 6:30 at Perkins Road Park. Hits: Paige (3), Jayson, Corey (2), Ashley, Russell, Eddie (2), Gary (2), Chelsea, Matt, and Eric. PLAYERS: Ashley Falcon (Civil Service), Chelsea Harris (Communications & Marketing), Corey Dorsa (SEC), David Carter (BRAC Liaison), Eddie James (Business Development), Eric Burton (Business Incentives), Gary Beadle (IT), Jayson Newell (Business Development), Matthew Wattigny (FastStart), Paige Ovens (Business Development), Rachelle Kilgo (Business Intelligence), Russell Richardson (Business Development), and Steven Grissom (Secretary). Will Day (Business Development) coached 3rd base. FANS: Chelsea’s boyfriend Brandon, Jayson Newell’s wife Beth, and Eric Burton’s wife Leigh Ann and their beautiful daughter Sophie. And nobody wanted to win more than the Zeppelins last night at Burbank Soccer Complex as LED took on the Department of Environmental Quality. LED played hard as nails until the final out of the game and so did DEQ. Defense was strong on both sides with the scoring coming largely from hitters finding the gaps. DEQ jumped quickly on the board scoring two runs at the top of the first, but the Zeppelins quickly countered with two of their own in the bottom of the first. With two outs, Ashley Falcon started a rally with a single, followed by singles from Corey Dorsa and Russell Richardson. Eddie James then knocked a ball to the outfield to score both Ashley and Corey. DEQ put up two more runs in the second while LED was unable to plate a runner. While holding DEQ down in the third, the Zeppelins chipped away again at the lead by scoring another run. Eric Burton started off the inning by legging out an infield single. Paige then hit a long single to left center to move Eric to scoring position. A few bats later Ashley knocked one into the outfield to score Eric. This put the score at 4-3. In the fourth, DEQ put another run on the scoreboard while LED was unable to score, leaving the Zeppelins down by two. LED held DEQ to no runs in the fifth, and then went on a scoring frenzy at the bottom of the inning. With two outs Eric started the rally by knocking out another single. Korey Patty then added a single of his own followed by a Paige Ovens double which plated Eric. Steven G. then shocked them all by placing one into deep left field from the left side of the plate. His double allowed Korey and Paige to score. Ashley then got up and knocked one to deep center field plating Steven G. These four runs put LED up 7-5. 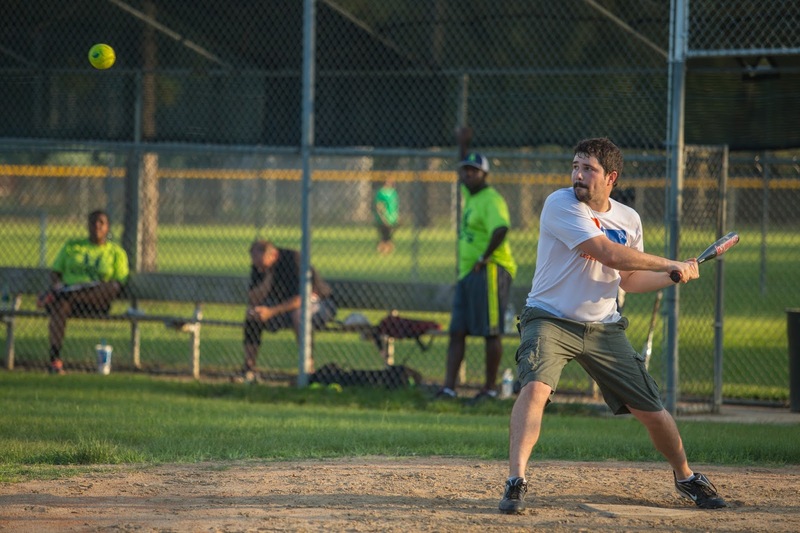 The lead was short-lived as DEQ scored three runs on three successive doubles and a single in the top of the sixth. DEQ was now up 8-7 and neither team would put up any more runs for the remainder of the game. In the final analysis Ashley and Eric both went 3 for 3, and Paige, Eddie and Korey all got two hits on the night. LED will face both the Department of Wildlife and Fisheries and DOTD next week as rainout makeup season has begun. Days/locations/times will be forthcoming. Doubles: Paige, Ashley, Steven G.
PLAYERS: Ashley Falcon (Civil Service), Chelsea Harris (Communications & Marketing), Corey Dorsa (SEC), Eddie James (Business Development), Eric Burton (Business Incentives), Gary Beadle (IT), Korey Patty (Lead Development), Matthew Wattigny (FastStart), Paige Ovens (Business Development), Russell Richardson (Business Development), Steve Baham (Business Incentives), and Steven Grissom (Secretary). Will Day (Business Development) coached 3rd base. FANS: Mills Richardson (Russell’s son), Susan Bigner (Business Incentives) and her daughter Katie, Steve Baham’s wife Rachel, Joe Coussan (Communication & Marketing).